This is the last in a 3-part series, in which I review Erin Lindsey’s ‘Bloodbound’ series. 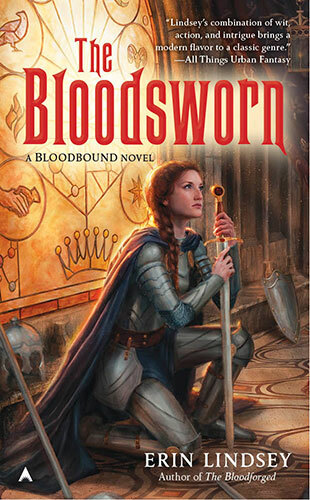 ‘The Bloodsworn,’ Book 3 of Erin Lindsey’s ‘Bloodbound’ series is a solid conclusion to an epic that is not written as traditional High Fantasy, even though the setting is Tolkienesque Medieval. There is plenty of suspense and further development of the deep connections forged between characters that is a defining element of Ms. Lindsey’s storytelling. The battle scenes are realistic and well executed. If there is one qualification I would make, it is that there are a few instances where the characters are squeezed out of particularly tight spots perhaps a bit too conveniently. Ms. Lindsey has left the door open for another book. Riggard’s relationship is left hanging, and King Erik may have finally found a romantic partner to take the place of Alix in his heart. And while The Oridians have been defeated, there is no real affection among the victors: Alden, The Republic of Onan, Harram and Andithyri. In fact there remains enough mutual disdain for the saga of Aldan to continue. Whether Erin chooses to take up her pen again in the cause of Alden remains to be seen. But in any case she should take it up again in some literary endeavor and I look forward to her storytelling in the future.